Sit and Play tables: On these you can sit down and play for as long, or short, as you like. The amount of chips you can sit down with depends on the blinds for that table. For example, if the blinds are 10/20 then you can only sit at that table with 200-2000 chips (Min = 10x Big Blind, Max = 100x Big Blind). Once at the table you can win an unlimited amount but the maximum you can sit down with is the 1000x Big Blind. Tournaments – Players enter these for a set amount and must play until they are either knocked out or win. All players are given the same number of chips (1000) and the blinds go up every 10 hands. All players can enter the White tournament to begin with and once you have won it you unlock the Yellow tournament and so on. Players can enter any tournament they have unlocked. All tournaments are played on a single table, however Poker Sharks will be having multi table tournaments in the near future. No Limit – means there is no limit to how much you can bet. Limit – there is a strict betting system and predefined limits on how much players can bet. Pot Limit – the maximum bet is limited to the size of the pot, meaning in the total chips that have been bet so far. 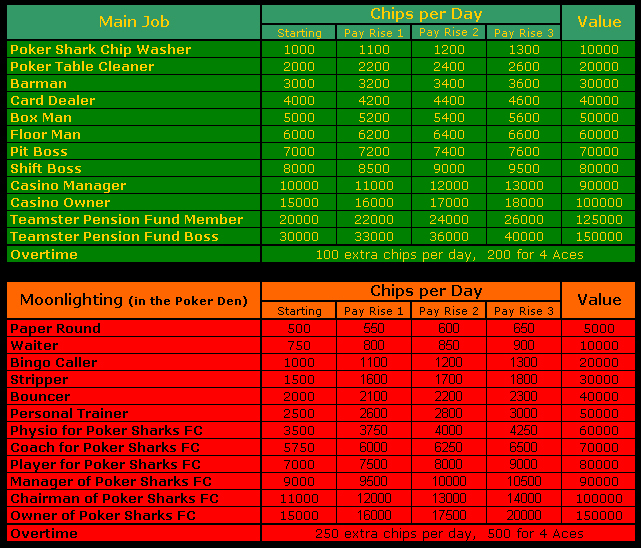 Any chips won can be deposited into your Poker Sharks account and be used to buy things for your shark. If you run out of chips then you’ll have to wait until the next day after your Poker Shark gets paid. Blue Shark – A very patient poker player, who is also good at slow playing his cards. Doesn’t like playing against Check-Raising players or those that go Allin. Check Raise -20% and Allin -10%. White Shark – Unsurprisingly this Poker Shark is very aggressive and isn’t bad at poker move Check-Raise. However, patience isn’t one of his virtues! Patience -20%, Flat Call -10%. Hammer Head – Master of the slow play and can sit for hours waiting for a premium hand. He is the quiet player of the table and prefers to live another day rather than put his chips Allin and risk the lot. Allin -20% and Fold -10%. Joker Shark – His favourite hand is 7, 2 off suit, this should say it all (worst hand in poker by the way). He-s careless with his chips but clever with it and can pull off the most amazing bluffs! Needs to watch out for players that slow play him however, he gets caught with his hand in the cookie jar a few too many times. Slow Play -20%, Check Raise -10%. Bull Shark – The most volatile player on the table and never short of an insult for a player that gets lucky. His chips can usually be found in the centre of the table after going Allin. Being this volatile and it often leads him into bluffs, patience and good folds are the key to beating him. Tiger Shark – Don’t be fooled by his smooth table presence. This player set traps and pounce on the player unlucky enough to walk into them. The Check Raise is his favourite and when he bets he bets big and aggressive. The only chance other players have is to be wary of these traps and to set a few of your own. Apparently slow playing and just flat calling him seem to work well. Flat Call -20%, Slow Play -10%. Nurse Shark – Being one of the careful players she rarely is first walking away from the table. She plays a tight, cautious game by just flat calling bets and not being scared to fold. She can be intimidated with brave bluffs if played at the right time. Angel Shark – Another cautious player that is hard to beat. As long as you have a chip and a chair you’ll still in, that is her strongest asset. An aggressive player can rattle her and she isn’t too good at spotting a bluff. Aggression -20% and Bluffing -10%. The daily tasks that are involved are: Poker Skill, Job, Luck, Challenging and Tournaments. I’ll explain in each in turn. The most crucial part of your Poker Sharks development is of course his Poker Skill. You have 8 different Poker Skills and you have the choice as to which 4 you train each day; Bluffing, Slow Play, Patience, Aggression, All-in, Check-Raise, Flat Call and Fold. To do this you will need to play one hand of Texas Holdem Poker. To get to the game click the button next to each stat. As you progress through the game you will notice that the amount you win for Poker Skill training increases. This is because you start on Level 1 and when have gained a certain amount of Poker Skill you will move up a level. There are 7 levels and the amount of Poker Skill to be won increases each time. Once you reach the Level Increase amount over all your Skills combined you will move up a level. You will play this game 4 times a day, once for each skill of your choice. You only have ONE attempt at each Poker Skill so pay attention! The cards gradually increase in speed as you progress. First of all you will be dealt 2 “Hold Cards”, these are luck of the draw and you can’t change them. Next you will see 3 cards face down on the board, these are called the”Flop”. Click each one in turn to try and make the best hand possible. Another card will be dealt, called the “Turn”. You’ll notice the cards are whooshing past quite quickly at this point. Finally the “River” is dealt and so in total there are 7 cards showing. The best 5 cards from these 7 are taken to make the best hand possible. Earning Poker Chips is very important, a player with no bankroll can’t enter the big tournaments and can’t buy a nice house. This is where your Job comes in. Each day you will have the chance to improve the job you have, and hence, improve your salary. Find this game by clicking the white Poker Chip labelled “Job” on the bottom right of the main screen. To complete the game you have to get 4 of a kind. The cards are all varying speeds so be careful! There are 3 pay rises inside each job, which then earns you a promotion to a brand new job. Getting 4 Aces boosts you on 3 pay rises straight to a promotion. This game is played once a day and Chips are paid once a day. If you reach the top Job you’ll then be able to try and earn some overtime. The pay isn’t much, but every little helps. Running out of chips, want another Job??? Check out the Poker Den for a Moon lighting Job and have a few more Chips coming in. No matter how good a Poker Shark is if the hands don’t hold up and your pocket rockets (ACE, ACE) get beaten there is nothing you can do. After clicking the red Poker Chip labelled “Change” in the Luck area you’ll be dealt 13 cards. These cards range from 2-Ace. The highest card is the Ace. You get 1 attempt to find that Ace. This game is played once a day, and your Luck card will last for one day. If you don’t log back in and change it the following day then it will be reset to a 6. So no getting and Ace then never playing it again. On a bad streak of luck, don’t like the odds??? ??? In the Poker Den you get 3, yes THREE attempts to find the Ace. This is where big moves can be made. By clicking the Challenge Button, which is the big Red light you will enter the Challenge area. In here you can view all your previous challenges and see the results. An overview of the last few challenges is on the main screen on a card next to your Poker Shark. You can’t challenge anyone you want however. The other Poker Shark must be at least 50% of your Value but not more than twice your size. This ensures there isn’t any bullying in Poker Sharks. You also can’t challenge the same Poker Shark once than once in a row. You have to alternate your challenges each day between at least 2 sharks. There is also an anti-bullying clause where no one shark can challenge another more than 10 times in a 7 day period – this is regardless of whether it resulted in a win, lose or draw. There are loads of players out there so vary those challenges around a bit. The reason you challenge players is to win an amount of their Poker Skill and also their personal items. You can add items to the challenge, but the item will be added on to their Poker Skill so will make them harder to beat. 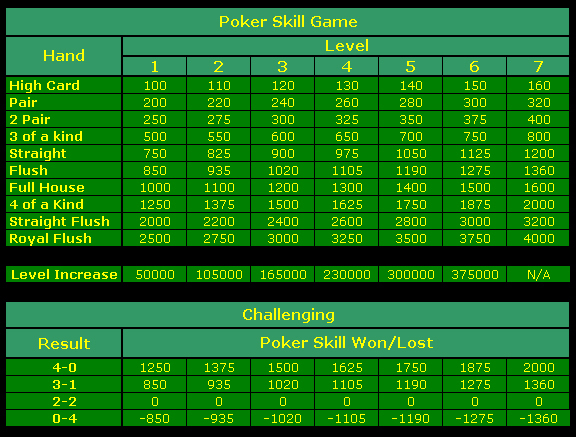 Before entering the challenge you will have to select the 4 Poker Skills you want to challenge with. Items can only be won if all 4 skills are won. You can challenge 5 times per day and you can be challenged 5 times per day. When you have been challenged the Challenge button will flash so you can see what’s happened. Click a name and wait for their picture and the challenge button appear on the bottom left of the screen. You’ll notice that you can see their Value, Tournament Grade but most importantly Luck. It might be worth your while searching around for a good player with bad luck, it will be more beneficial than playing a worse player with good luck. This is where you can add items to the challenge. You can add only one item per challenge, and only win what you don’t already own. You don’t have to add any items and just challenge for Poker Skill. Remember if you think it is going to be close, don’t add any items, as this will increase the chances of you losing. Once you’ve clicked the challenge button the challenge will begin. The challenge consists of one hand of Texas Holdem Poker. You are each dealt 2 Hold Cards and then 5 community cards are dealt on the board. The best 5 cards win the hand. This is all automatic and is based on your individual Poker Skills, Poker Shark Value and Luck. Once the challenge has finished the result will be shown. NB You cant challenge any player that has already been challenged 5 times that day, or any player less than 50% of your own Value. NBB For players who played the original Poker Sharks game don’t expect to win every challenge as before. Random elements will be in force that will affect some challenges so expect the unexpected. Each day you can enter a Tournament by clicking on the Blue Tournament button. To begin with you can enter your Poker Shark into the White Tournament by clicking the White poker chip in the top left hand corner. 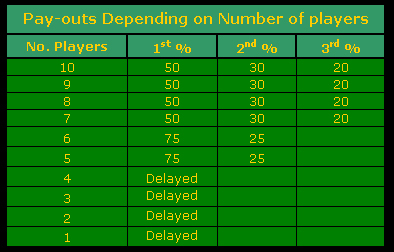 Each tournament is played once at least 5 players (max of 10) have entered your tournament. This is then played overnight all by itself and the next day he blue button will flash, letting you know the result. Once you have won the White Tournament you can move onto the next grade and so on. The top Tournament is the Premier Grade Tournament – once you have reached this level you can only play Premier Tournaments form now on. The first players to get here may have to wait a few days for players to catch up. To give your Poker Shark the best chance in these Tournaments to move him up the grades and get some chip winnings into your account ensure your Poker Skills are nice and high and your Luck Card for the day is as high as possible. This is a weekly tournament that is played every Saturday were every Poker Shark can enter and pit their Poker Skills against every other Poker Shark. You can enter during any time the week before for 1000 chips. The size of the prize pool depends on how many players enter. 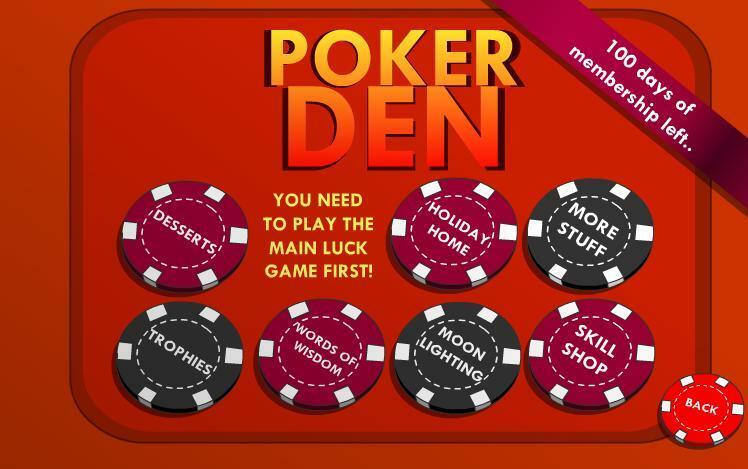 Inside the Poker Den your Trophy Cabinet will cater for some trophies for this tournament. You will be able to see medals for your finishes in the top 100, 50, 20 and 10 and also special trophies for when you have come 1st, 2nd or 3rd. Here you can buy much needed accessories for your Poker Shark. Buy them items to increase his Value and push him up the Rankings List. The more items you have the higher your Poker Skills will go and hence the higher your overall Value will become. You can only buy items once and can’t sell them back once they’ve been bought. Want to have more stuff??? 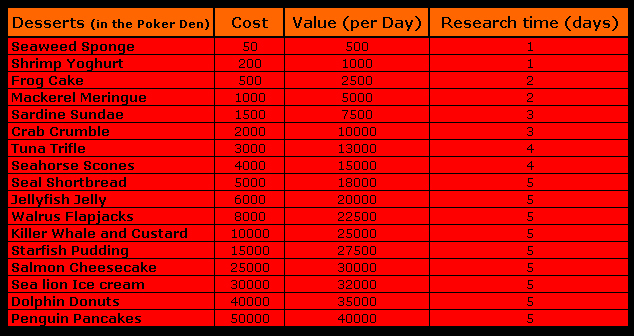 Inside the Poker Den there are more items to buy and more chance of you moving up the leader board! Every Poker Shark needs a nice place to stay. So the quicker you get him out of the Cardboard box and into the Barrier Reef the better. Progress through the houses by saving up you wages and Tournament winnings to buy the next house on the ever more expensive property ladder. Ever fancied going on holiday??? 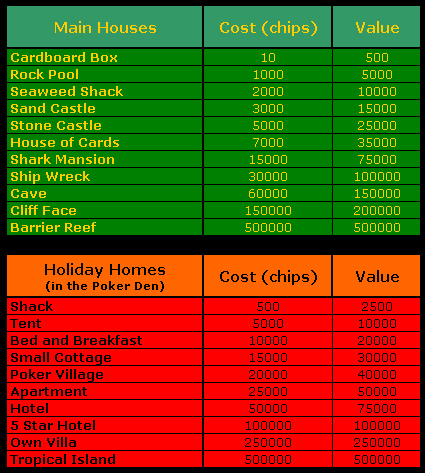 The Poker Den has some great holiday homes. Food is very important to your Poker Shark, the better food you feed him the quicker he will improve and the faster he’ll grow. However, your Poker Shark isn’t the best Chef in the world and it takes him time to perfect each meal. First you have to save up the Chips to be able to afford the ingredients. Then you’ll have to wait a number of days for each meal to be researched and perfected by your Poker Shark. 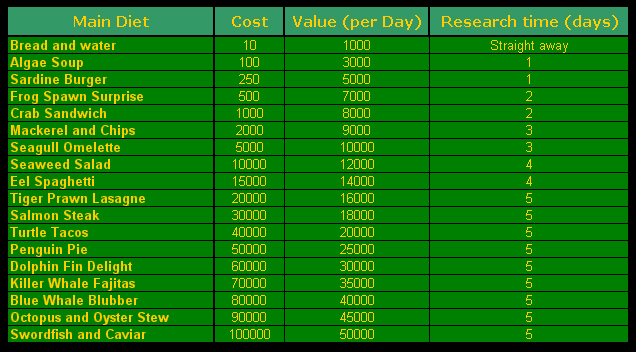 Once the meal has been researched a certain amount of Value will be added to your Poker Shark each day, so make sure you always have him researching something if possible. Got a sweet tooth??? There are some great desserts in the Poker Den. RANK: Orders everyone by Value. CHIPS WON: Total number of Chips won in tournaments. SKILL WON: Total amount of Poker Skill won in Challenges. MOST UNLUCKY: Total number of times a player has finished 4th (just out of the money) in a Tournament. CHIPS: Number of Chips a player has at that moment in time. POKER SKILL: Amount of Poker Skill players have at that moment in time. The Poker Den is full of bonus features that will give your Poker Shark the edge over everyone else. It costs just £5 (approx 6.8 US dollars) for 100 days of membership, which works out at 5p per day. All memberships can be carried over from season to season so don’t worry if you’re joining half way through. A special offer of 400 days for the price of 300 is also available. For £15 you will have over a year, equalling 4 seasons of membership. This is a great deal for players that want to save some money as well as offering their support for the next year. All payments are taken through Pay Pal which is very secure and you will be asked for a one off payment and from then on you will have UNLIMITED access to the Poker Den and all of its features for the next 100 or 400 days. Earn more chips per day with a sneaky moonlighting job. Your second chance at some better luck for the day, have another go at finding that Ace. Poker Sharks have massive teeth so imagine how big their sweet tooth is! Research deserts and have your value going up faster and faster each day. An unlimited supply of Poker Skill available from inside the Poker Den for the price of 1 Poker Skill for 50 chips. Not the best value in the world but once you have brought everything it will be a very handy place to go and spend those otherwise worthless chips. Buy things that you don’t need but really, really want. Buy a Holiday Home in the sun. View your tournament trophies for both your daily and World Poker Shark Series Tournaments in here. This is also the only place you can change you Word of Wisdom. Don’t type anything offensive in here or the Poker Gods will change it to ‘I love Poker Sharks!’ forever! You’ve been warned. This agreement ( the Agreement ) describes the terms on that Poker Sharks offers you access to an account (the Account) to play the Poker Sharks online game (the Game). By clicking the “Register” button, you accept the terms and conditions below. 1. All fees are prepaid and non-refundable. By completing an order throughone of the implemented payment solutions, you authorise us to automatically collect payment using your selected method of payment for the Account fee. 2. We may amend this Agreement at any time in our sole discretion. Amendments shall be communicated to you via email. Such amendments shall be effective whenever we make the notification available for your review. 3. During registration, you will choose a password. You may not disclose your password to any third party. We will never ask you for your password by telephone or email or any other form of insecure communications, and you should not disclose it this way if someone asks you to do so. Your web browser may allow you to save your password so you do not have to remember it, please note that third parties may be able to access your computer andthus your Account. It is possible to request your password if you have forgotten it on the login page by entering your email address. 4. Subject to the terms of this Agreement, we hereby grant to you a non-exclusive license to access the Game through your Account. You may not copy, distribute, rent, lease, loan, modify or create derivative works, adapt, translate, perform, display, sublicense or transfer any content ofthe Game or your account. 5. We may terminate this Agreement (including your Account) immediately and without notice if you breach this Agreement or repeatedly infringe any third party intellectual property rights, or if we are unable to verify or authenticate any information you provide to us, or violate this agreement. 6. To obtain an Account, you will be required to choose a login name, Poker Shark name and a Word of Wisdom. While you are encouraged to use a pseudonym,especially if you are a minor, you may not pick a name that violates anyone’s trademarks, publicity rights, other proprietary rights, or names that can be found to be insulting. We will determine, in our sole discretion, if a name is unsuitable, and may choose to rename your account to a more suitable name, or delete the account. 7. You shall comply with all applicable laws regarding your access to your Account and your playing of the Game. This section presents the rules for playing the actual Game. (a) A multi is a player who owns more than Poker Shark. (b) If you create another Account and intend to still play the original Account, you are a multi. (b) The transfer of accounts to other users is not permitted. Passing on your login details to another user is not permitted, even if they are subsequently the only user to access your account. (c) As newer methods of cheating are discovered, you authorise us to interpret all data logged about your account towards detecting these methods. Actions which are deemed to be cheating are not restricted to the list and may be added to at any time, and you authorise us to do so. (b) Any such actions will result in the warnings/ account suspension/ or account closure. (a) All interaction between accounts in the presence of other evidence. (b) More than one account using the same IP.